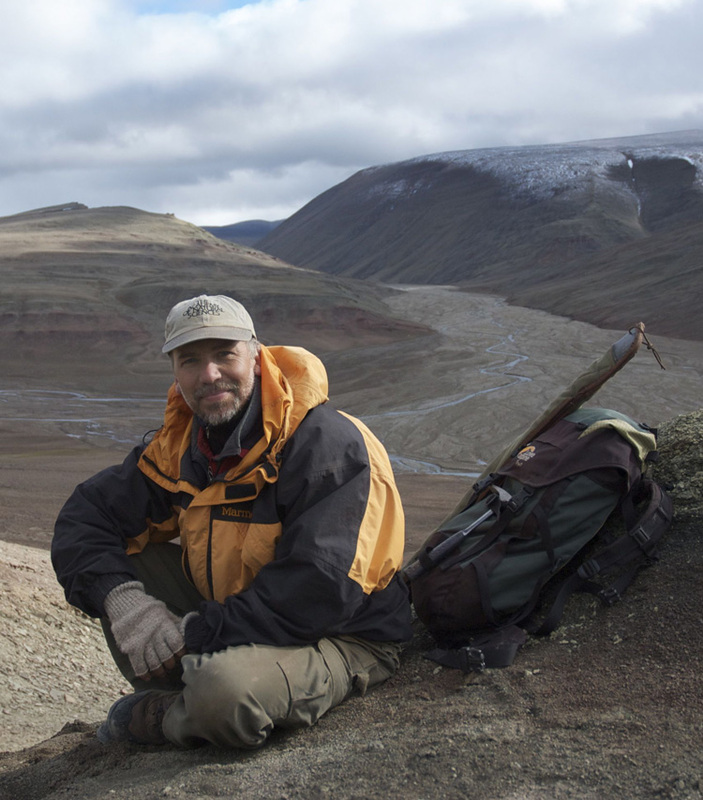 Ted Daeschlers current research program in vertebrate paleontology focuses on the vertebrate fauna of the Late Devonian Period (385-363 million-years-ago) in eastern North America. The research involves active fossil collecting, systematic work focusing on freshwater vertebrates, and the nature of early non-marine ecosystems. Fieldwork is ongoing since 1993 in Pennsylvania and since 1999 on Ellesmere Island in the Canadian Arctic. Fossil discoveries from the incompletely-known Late Devonian interval help us to answer questions about the diversification of major groups of fishes, the origin of limbed vertebrates, and the invasion of land by plants and animals. Links to web sites on this research: Academy of Natural Sciences of Philadelphia, Tiktaalik roseae and Devonian Times. Other interests include the early history of vertebrate paleontology in North America. Links to web sites on this research: The Thomas Jefferson Fossil Collection and Joseph Leidy - Father of American Vertebrate Paleontology. Miscellaneous links: An appearance on The Colbert Report, An essay for "This I Believe". The National Science Foundation  Collaborative Research: Late Devonian Tetrapodomorph Fishes and the Origin of Tetrapods. June 1, 2006  May 31, 2010. The National Geographic Society Committee on Research and Exploration  Late Devonian fossils from the Canadian Arctic and the early evolution of limbed vertebrates. June-August, 2008. Anonymous Private Donors  Fossil Preparation Lab Project 2008/2009 and Nunavut Paleontological Expedition 2008. NEW: Pennsylvania Historical and Museum Commission  Storage Facility Upgrade for the Vaux and Seybert Mineral Collections at the Academy of Natural Sciences. October, 2008  June, 2010. Daeschler, E. B. and N. H. Shubin. 1998. Fish with Fingers?. Nature 391:133. Daeschler, E. B. 2000. An early actinopterygian fish from the Upper Devonian Catskill Formation in Pennsylvania, USA. Proceedings of the Academy of Natural Sciences 150:181-192. Daeschler, E. B. 2000. Early tetrapod jaws from the Late Devonian of Pennsylvania, USA. Journal of Paleontology 74(2):301-308. Ahlberg, P. E., Z. Johanson, and E. B. Daeschler. 2001. The Late Devonian lungfish Soederberghia (Sarcopterygii, Dipnoi) from Australia and North America, and its biogeographic implications. Journal of Vertebrate Paleontology 21(1):1-12. Downs, J.P. and E.B. Daeschler. 2001. Variation within a large sample of Ageleodus pectinatus teeth (Chondichthyes) from the Late Devonian of Pennsylvania, U.S.A. Journal of Vertebrate Paleontology 21(4):811-814. Davis, M., N. H. Shubin, E. B. Daeschler. 2001. Immature rhizodontids from the Devonian of North America. Bulletin of the Museum of Comparative Zoology 156(1):171-187. Daeschler, E. B., A. Frumes and C. F. Mullison. 2003. Groenlandaspidid Placoderm Fishes from Late Devonian of North America. Records of the Australian Museum 55(1):45-60. Shubin, N. H., E. B. Daeschler and M. I. Coates. 2004. The early evolution of the tetrapod humerus. Science 304(5667):90-93. Davis, M., N. H. Shubin, and E. B. Daeschler. 2004. A new specimen of Sauripterus taylori (Sarcopterygii; Osteichthyes) from the Famennian Catskill Formation of North America. Journal of Vertebrate Paleontology 24(1):26-40. Wilson, H. M., E. B. Daeschler and S. Desbiens. 2005. New flat-backed archipolypodan millipedes from the Upper Devonian of North America. Journal of Paleontology 79(4):737-743. Friedman, M. and E. B. Daeschler. 2006. Late Devonian (Famennian) lungfishes from the Catskill Formation of Pennsylvania, USA. Palaeontology 49(6):1-17. Shubin, N. H., E. B. Daeschler and F.A. Jenkins, Jr. 2006. The pectoral fin of Tiktaalik roseae and the origin of the tetrapod limb. Nature 440:764-771. Daeschler, E. B., N. H. Shubin and F. A. Jenkins, Jr. 2006. A Devonian tetrapod-like fish and the evolution of the tetrapod body plan. Nature 440:757-763. Downs, J. P., E.B. Daeschler, F. A. Jenkins, Jr, and N. H. Shubin. 2008. The cranial endoskeleton of Tiktaalik roseae. Nature 445:925-929. Daeschler, E. B., J. A. Clack, and N. H. Shubin. In press. Late Devonian tetrapod remains from Red Hill, Pennsylvania, USA: how much diversity?. Acta Zooloica.